Around the web...and Crop & Create: Delivered sneak peek! Just doing a little search around the web today at some of our favourite stops and came across a few little happy things to share with you! We have more information provided on our website here. Crop & Create: Delivered will be available for sale at 9:00 p.m. EST Friday, March 1st (that's tomorrow already!!!) This kit is very limited so be sure to join us for the full reveal. Here is a little sneak too! Handmade heart wall hanging with Beth...and one more!!! I could look at home décor boards on Pinterest ALL day! I was so inspired by some of the DIY projects that I created a neighborhood craft night so my friends and I could create fun, personalized home décor pieces while enjoying a glass of wine and some girl time! and voila! Handmade heart wall hangings! You can see some of our past neighborhood craft nights here and here! I hope you will join me for even more Pinterest inspired projects in my Create the Perfect DIY Embellishments class that I’m teaching at several Crop & Create events this year. I’d love to see you! Surprise! We've started the unveiling of our newest project! Learn all about Crop & Create: Delivered HERE including some sneak peeks too! Full reveal is on Friday at 9:00 p.m. EST so mark your calendars...it won't last long! It’s that time of the month again!!! Time for a new tag! I am really early on this one but I am in a St. Paddy’s Day state of mind. I pulled out some of my favourite things for this “Lucky Me” tag. I punched the layers of tissue at the same time with a scalloped heart punch and layered them together to make a shamrock shape. Then I pinched the base or tip of the hearts together and glued them down. The button masks the squished bits. 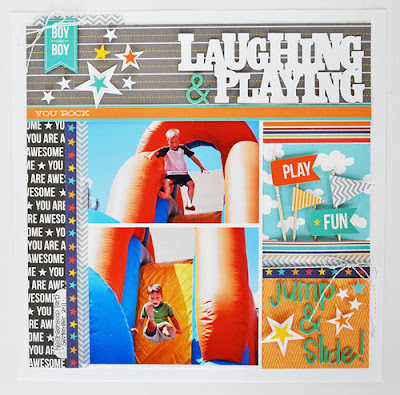 The Trendy Tape from Queen & Company was a lickety split background solution and makes for the perfect lucky rainbow! Another quick, but fun tag that can easily be adapted to a card or layout! Have fun! We will have more information on this exciting news later today! Stay tuned! Pinterest + Beth Kingston + ribbon = INSPIRATION! Happy Monday to the SCT gang! Today I wanted to give you a little sneak peek of one of the projects we’ll be creating in the Pinterest inspired class called "Create the Perfect DIY Embellishments" that I’ll be teaching at several Crop & Create events this year! Gorgeous ribbon cards of every theme and color can be found on Pinterest, but they look like they would take forever and be complicated (and messy) to create. Not so! You don’t need a lot of fancy tools or expensive supplies to create a ribbon card - in my class we’ll create one using just one sheet of cardstock, a Xyron 5” creative station, and some scraps of ribbon. You know how much I love to show people how to use items from their stash! I had so much fun with this idea that I made my Christmas cards, then my New Year’s cards, then my Valentine’s Day cards all using this technique. You will become addicted too! This is just one of the many techniques and fun projects we’ll create in class – I hope you’ll join me in Winnipeg, Burnaby and Ottawa for this and a whole bunch of other Pinterest inspired projects. Can’t wait to see you! Thank you Beth! For those that watch the HSN craft days, you might recognize Beth Kingston as she is Xyron's on air personality and always has some fabulous tips and tricks to share! Click on these links for more about Beth's classes in Winnipeg and in Burnaby! For those that have taken a class with Beth, you know the fun you have and the wonderful Xyron goodies you leave with ;) And if you are on Pinterest, be sure to follow the Scrapbook & Cards Today boards here! Join us tomorrow as Aly Dosdall is here and we have a little bit more to share about this exciting news! of something fun we're working on! Join us right here Tuesday to learn all about it! We are SO EXCITED to share it with you! A Bella Blvd. giveaway and...CardMaps Vol. 3! Good morning SCT friends! So glad you joined us as we've got fun things to share with you all today! Have you been following the blog this week and the beautiful work Laura Vegas did with the new Bella Blvd. feathers? 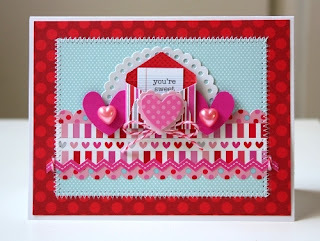 Laura also shared several tips on how to work with feathers on a layout in Wednesday's post here! Brilliant girl! Can you imagine what we have to give away today? Why some feathers of course! Our friends at Bella Blvd. would love to share, not one, not two but ALL18 colours with one lucky SCT reader! As Laura showed these feathers are incredibly versatile and add wonderful dimension to your projects! If you would like to be the lucky winner of these fabulous feathers from Bella Blvd., just leave a comment below by February 28th! We would also love you take a second and send Bella Blvd. a big SCT THANK YOU on facebook here! Last week our friends at Webster's Pages introduced beautiful new stamps from Allison Kreft. We were beyond thrilled to be able to offer these three winners not one but two stamp sets of their choice! Congratulations ladies! Please send us your mailing address to ideas@scrapbookandcards.com with "blog winner" in your reference line and Webster's Pages will get those right out to you. We would also love to leave you on a little surprise today. Please help us to welcome CardMaps Vol. 3 to the Scrapbook & Cards Today family! Filled to the brim with seasonally inspired cards from some of today's best card designers! It includes 45 exclusive CardMaps sketches from Becky Fleck, over 70 cards with instructions and beautifully photographed technique step outs! We could not be more thrilled to introduce this special resource guide to our readers! We have limited quantities of this issue available so please be sure to preorder before it's gone! CardMaps Vol. 3 will ship on March 18th. Preorder HERE! Of course, life around the SCT offices are never dull so please join us tomorrow for a very special announcement! I'm not sure we'll sleep tonight as we are pretty excited about this one :) Any guesses?